St. Patricks Day is a holiday I really don’t know much about. 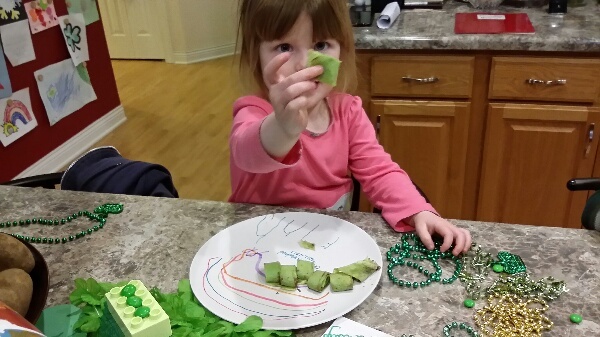 Isla had a celebration in her school yesterday…or more like tricky little leprechauns visited her classroom and left it a complete mess. They turned the toilet water green, left little foot prints all over the class, turned the rice in the sencory table green, hung toilet paper from everywhere. They also dumped some toy bins all over the floor. For fun, the kids were asked to bring in a leprechaun catcher to see if they can catch one during the days celebrations. 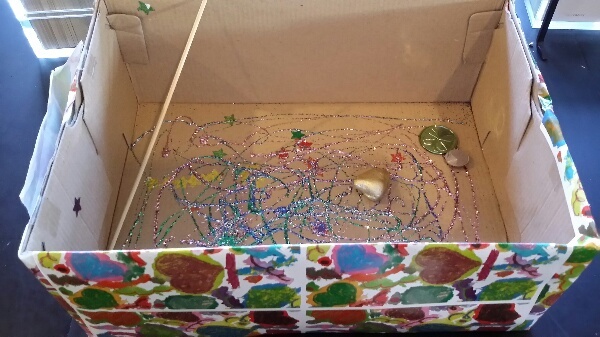 We used a shoe box and a lot of glitter glue. Instead of just throwing the box away, I decided to leave it out last night to see if we could catch tricky little leprechauns at home too. 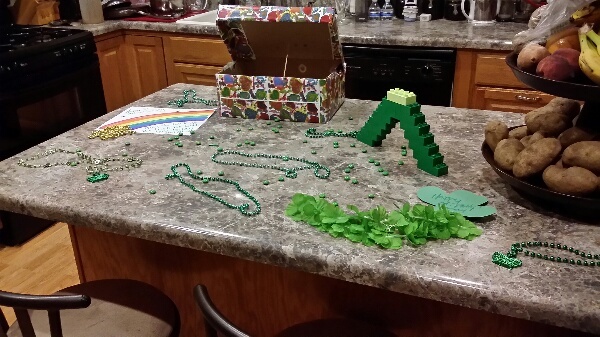 It didn’t work, but the leprechans did seem to find all of the green necklaces in the house. All of the green legos were built into a green rainbow (although Finnegan thought that it looked like a leprechans pants) and our crepes were turned green. All in good fun! Isla was a little hesitant about eating the crepes, but finally tried them. Finnegan told me that he knows it was me that did everything. I just smiled and said “Isn’t this fun?” He decided it was fun, and went along with it. Have a great St. Patricks Day! Is there anything special you do or have done when you were a kid?